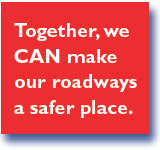 Help Keep Our Roadways Safe! According to the National Highway Traffic Safety Administration (NHTSA), three out of every ten Americans will be involved in an alcohol-related crash at some time in their lives. Below are five steps each of us can take to reduce the risk of drunk driving accidents and make our roadways safer for ourselves and our loved ones. Alcohol-impaired driving is an issue that affects Everyone on the road — even those who NEVER drink and drive. So know the facts and understand the risks. On average, someone is killed by a drunk driver every 45 minutes. These fatalities are even more devastating because they are often 100% avoidable. #2: Understand the Differences in Blood Alcohol Concentration levels (BAC), and how they affect driving ability. The number of drinks. The more you drink, the higher the BAC. How fast you drink. When alcohol is consumed quickly, you will reach a higher BAC than when it is consumed over a longer period of time. Your gender. Women generally have less water and more body fat per pound of body weight than men. Alcohol does not go into fat cells as easily as other cells, so more alcohol remains in the blood of women. Your weight. The more you weigh, the more water is present in your body. This water dilutes the alcohol and lowers the BAC. Food in your stomach. Alcohol is absorbed directly through the walls of the stomach and the small intestine, goes into the bloodstream, and travels throughout the body and to the brain. Absorption will be slowed if you’ve had something to eat. #3:Be a Good Role Model. Never allow guests to drive home impaired. Take away their keys and call them a cab, or let them spend the night. Always have plenty of food and non-alcoholic drinks available. State officials have made a call to all citizens to report any potential drunk drivers to local authorities by calling 911 or your local police. Please visit Montlick.com or HelpKeepKidsSafe.org and click on: Family Safety & Legal Tips to see our latest safety videos and downloadable materials, and to register for your Free Safety Alerts.